Mul-T-Lock’s patented security solutions have been installed by local Locksmiths H Harrold & Sons in properties belonging to Firth Homes. With the onsite security installed when the development was built over 40 years ago, residents were at risk of failing products and latest trends in crime, including a rise in cylinder manipulation attack. H Harrold & Sons was contacted to specify a suitable solution, to ensure residents safety and security. After trialling Mul-T-Lock’s specialist Break Secure XP cylinder with a high security sash lock, positive resident feedback ensured a successful installation throughout the 28 properties on site. “We have a duty of care to our elderly residents. The average age at our homes continues to rise and this presents added considerations. We wanted a lock that offered us the highest security and would be easy to use and simple to maintain. And the resident feedback to Mul-T-Lock’s solution is unanimously positive. “It has been a big project and the result is very reassuring for the Trustees. Not only does it make our residents feel more safe in their own home, but they found the design of the key and its orientation in the lock much easier to use and now every resident can now locate the key correctly at the first attempt compared with other locks. 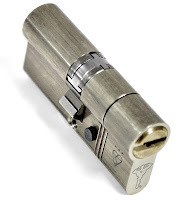 Mul-T-Lock’s Break Secure XP cylinder is purpose designed so that the front of the cylinder deliberately snaps under attack at a particular breaking point, leaving the main portion of the cylinder intact and fully functioning. It is supplied with Mul-T-Lock’s double-sided key that can be used either way to open the lock. For more information on Mul-T-Lock’s Break Secure XP cylinder range, please visit www.breaksecurexp.co.uk. For all other enquiries, please visit www.mul-t-lock.co.uk.